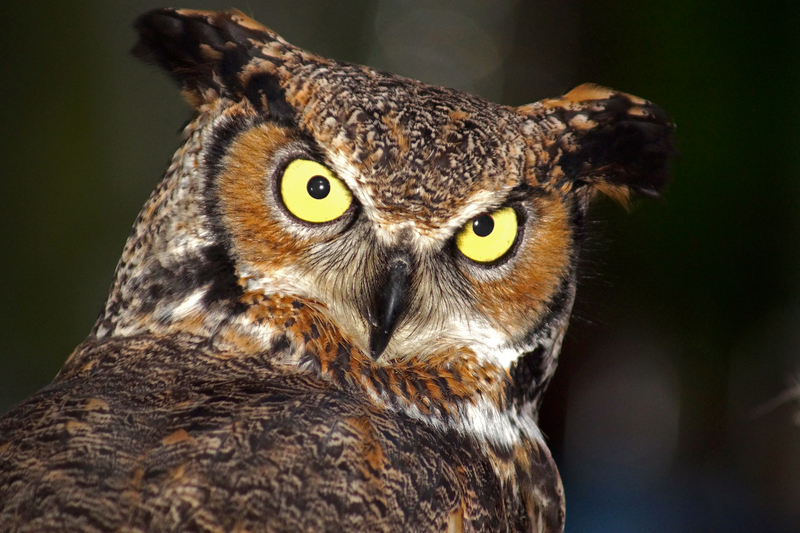 Visitors will experience being predator and prey through a radio-controlled "spider and mouse game" and identify what owls – such as this great horned owl – prey on by dissecting an owl pellet at Sunday with a Scientist Oct. 9 at Morrill Hall. The University of Nebraska State Museum's October Sunday with a Scientist program for children and families will explore predators. The event is 1:30 to 4:30 p.m. Oct. 9 at Morrill Hall, 645 N. 14th St.
John Delong, assistant professor in the University of Nebraska-Lincoln's School of Biological Sciences, and scientists from the Delong Lab will lead visitors in a variety of hands-on activities. Children and families will find out what predators eat by hunting for clues throughout the museum; experience being a predator and prey through a radio-controlled "spider and mouse" game; and observe microscopic predators and learn how they live and what they feed on. Children will have the opportunity to dissect owl pellets and identify the types of species on which owls prey. Sunday with a Scientist is a presentation series that highlights the work of scientists, while educating children and families on a variety of topics related to science and natural history. Presenters share scientific information in a fun, informal way through demonstrations, activities or by conducting science on site. The presentations typically take place from 1:30 to 4:30 p.m. on the third Sunday of each month. For more information, including upcoming topics, click here.